The U.S. military just confirmed what we've been warning readers about for years: that America's nuclear arsenal is not prepared to counter enemy threats anytime soon. The reason why is a simple one. We haven't upgraded our nuclear program… but our adversaries have. Stratcom commander Air Force Gen. John E. Hyten admitted as much to The Washington Free Beacon today (July 31). He thinks the U.S. military's slow movement toward modernization is a serious problem. 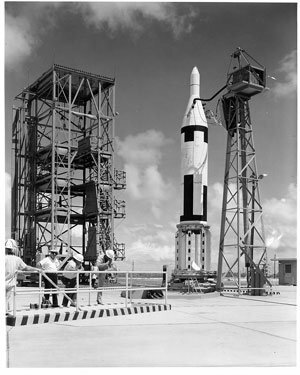 The U.S. military's Polaris A-1 sub-launched ballistic missile (SLBM), first tested in 1960. And not just in the face of North Korea's threats, but in response to Chinese and Russian nuclear improvements too. For example, Hyten pointed out that Russia announced plans to upgrade its own nuclear arsenal in June 2015, saying that 70% of it will be upgraded by 2020 at a cost of $560 billion. "Whether they get there or not, I won't comment on, but that was a stated objective, and I'll just point out that in 2020, [the U.S. nuclear arsenal] will be zero percent modernized," Hyten said. "Hyten's admission is a pretty big deal – and it's not just nukes," Bill says. "We've fallen behind in nukes, cyberwarfare, and space as a 'high ground' spot in the battlefields of the future." North Korea will succeed in its efforts to create sub-launched ballistic missiles (SLBMs) – an achievement that will put the mainland U.S. within range of the threats being made by Kim Jong Un. China's militarization of the South China Sea – coupled with its lack of "transparency" (military speak for "we have no damned idea how far they will push things") – creates a major risk for America and its allies in the Pacific Rim. China and Russia will succeed in creating conventional and nuclear-tipped "hypersonic" weapons – leapfrogging U.S. leadership (and stalled programs) in these areas, resulting in a new and real threat that the American military can't currently defend against. Take, for example, the first risk: SLBMs. We have one operational SLBM – UGM-133 Trident II – which was commissioned and deemed operative way back in 1990. Meanwhile, Russia has three SLBMs. China has one (that we know of). And North Korea, as we've mentioned, is well on its way. But, as Gen. Hyten points out, the entire U.S. nuke arsenal is lagging far behind. "A lot of this stalling has to do with U.S. bureaucracy at its worst," says Bill. Look at the 2010 stalemate between former President Barack Obama and then Sen. Jon Kyl (R-AL). After months of back and forth between Kyl and the White House about updating the U.S. nuclear arsenal – during which time Obama's admin proposed spending $80 billion over 10 years on the nuke complex and then added another $4.1 billion in 2012 as a last-ditch effort to appease congressional Republicans – Kyl still nixed the idea. This "failure to compromise" between the two parties stalled upgrades for at least four years, given the talks had initially started in 2008. The Minuteman is an ICBM capable of obliterating any spot on Earth with a nuclear blast in 30 minutes or less. While this sounds like a state-of-the-art weapon, there are major issues with the Cold War-era missile and its control centers. For one, they've not been upgraded since the 1990s. And now, when a Minuteman is tested, spare parts for it are in such short supply that the military has been known to pull them from museums, according to The Los Angeles Times on May 30. The U.S. military needs to catch up with its sub-launched ballistic missile cache as well. "Those are where nukes are headed next as far as developments are concerned," Bill says. "Sub-launched missiles, for example, are key. They're more flexible. Plus, we know that's what North Korea itself is working on right now." Indeed, though the Trident model does work, the Navy deemed it due for upgrades just this past May. These upgrades were not ordered to counter those of Russia, China, or North Korea, however. Rather they were requested "to prevent obsolescence and ensure the missile system remains viable for the next several decades," reported Scout.com – a website that follows military recruitment efforts. In other words, the military ordered Trident upgrades to keep it from falling apart and not for the sake of improvement. Meanwhile, Bill has covered North Korea's SLBM advancements in depth in his subscription service Private Briefing over the past several months, outlining in particular Pyongyang's first successful SLBM launch in August 2016. The 500-kilometer distance that particular weapon reached clearly indicates that North Korea's push to develop its weapons has indeed paid off. It's because of these advancements, along with the Pentagon's long history of denying the fact that they're even being made, that leads Bill to warn, "We've got a lot of catching up to do." In fact, one of the only areas the U.S. military has managed to upgrade is its anti-missile interceptors, which are not part of the U.S. nuclear arsenal, but of its defensive weapons cache. Yesterday (July 30), the Missile Defense Agency (MDA) — the Pentagon unit whose job it is to create a missile "shield" that protects U.S. cities and military operations — successfully tested the U.S.' Terminal High Altitude Area Defense (THAAD) anti-missile system in Alaska. The U.S. Air Force launched a medium-range ballistic missile over the Pacific Ocean, and the THAAD system — in Kodiak, Alaska — "detected, tracked, and intercepted the target," according to the MDA's statement. One of Bill's biggest defense stock winners – Boeing Co. (NYSE: BA) – has been a key player in THAAD's development, as well as that of the Pentagon's ground-based midcourse defense system – or GMD – that was successfully tested in May. Bill first recommended Boeing to his Private Briefing subscribers in 2011, years before any of these major successes. Then, BA was trading at just $61.92. Thanks to his keen eye for developments in the Asian Arms Race and which companies would counter these advancements first, Bill identified Boeing as a surefire "buy." Today, Boeing's share price is $243.57 – a price increase of 293%. THADD may be the best way to stop any missiles and I don't know if SDI was ever deployed, I just remember reading about Al Gore and Mike Dukakis supporting Midgetman missiles and "Democrats" labelling SDI Star Wars which may have really rubbed the filmmaker of that series the wrong way! I am sure that Gen. Mattis is on the case though-even the former President who went on the ill-advised Apology tour of the Arab world after the horrendous September 11 Massacres and Islamist Conspiracies came to "fruition". My brother was among the tens of thousands slaughtered by qaddaffi on December 21, 1988, and there are still appeasers among us.